Editor’s Note: Bryce Suderow completed this lengthy set of notes on the first day of fighting at the Battle of Boydton Plank Road (aka the Battle of Burgess Mill), fought on October 27, 1864 during the Siege of Petersburg, Grant’s Sixth Offensive. Bryce was gracious enough to share his research with The Siege of Petersburg Online and has given written permission for this article to appear here. Maj. Gen. John G. Parke’s role was to surprise the Confederate lines by Hatcher’s Run. Accordingly, he sent Brig. Gen. Willcox’s 1st Division up the road leading westward to Hatcher’s Run. Because a soldier prematurely discharged his rifle, the Confederate pickets were alerted. Willcox drove them back into their works. The sound of Parke’s guns alerted Heth that his right was threatened. He ordered Brig. Gen. Joseph Davis to move to the right with his Mississippi Brigade. Davis reached his position about half an hour after the skirmishing began and formed his line in a single rank, each man two paces apart. Parke then formed Potter’s 2nd Division on the right of the 3rd Division and ordered Potter to prolong his line so that his right touched his intrenched position at his camp. Parke then ordered the entire corps to intrench. After halting Ferrero’s attack, Davis’ Brigade was ordered to reinforce Dearing’s cavalry about half a mile to the right. Dearing prepared to march to Hampton’s aid, but Heth countermanded the order and Dearing was forced to remain in the works. After Crawford crossed Hatcher’s Run, Warren visited him in person and ordered him to advance to the north and, if possible, turn the works in his front. Warren said the works were about one mile away. Warren also told Crawford that Dennison’s Maryland brigade from Griffin’s 1st Division would report to him. The ground in front was held by 80 men belgoning to J.M. Hough’s company of dismounted men of the 6th South Carolina Cavalry. Hough’s men were placed five paces apart and kept the Federals at bay for three hours. As the skirmishers retired, Capt. Whitted told Lt. Charles R. Jones, commanding two companies in the 55th North Carolina’s center, to dress his command to the right. Jones turned his back to the enemy and, facing his men, gave the command. At this instant, a Yankee sharpshooter posted behind a pine tree about 65 yards distant, took aim at him and fired. The bullet whizzed past within three inches of Jones’ right ear and struck Private B.G. Mason, Co. I, in the forehead, killing him instantly. The skirmish continued for some time, Stone’s regiments refusing to give ground, though fully expecting to be captured by Crawford’s Federals. At this time Dearing informed Heth that Hampton had ordered him to the Vaughan Road. Heth countermanded the order, sent Major Venable of his staff to tell Hampton that Dearing would be delayed, and sent for Cooke’s brigade to take Dearing’s place. McRae’s, Walker’s and Archer’s Brigades moved to the right to fill the gap left by Cooke’s shift; Lane and Wilcox spread out their men to cover the ground lately occupied by these these brigades. (Venable was captured en route to Hampton by Federals and did not reach Hampton, an event which allowed Hancock to penetrate the area behind Hampton.) At about — Heth sent across Hatcher’s Run Dearing to join Hampton at Burgess Mill. Hancock began his march along the Vaughan Road at 3:30 a.m. and reached Hatcher’s Run around daylight. 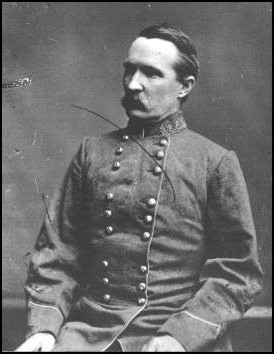 Maj. Edward Anderson, 7th Georgia Cavalry, Young’s Brigade, held the crossing. Anderson’s Confederates skirmished with Hancock’s advance until Smyth’s 3rd Brigade of Egan’s 2nd Division charged across and drove him off. Smyth suffered about 50 casualties in the encounter. Egan, followed by Mott, entered the Boydton Plank Road a mile south of Burgess’ Mill. Hampton’s plan to damage the Union cavalry began well. Butler’s Division withstood Smith’s attack and Lee attacked Gregg’s rear and drove in one of his brigades. Gregg held his ground, however. Before Hampton could attack again he received alarming news: A large force of infantry were in his rear marching toward White Oak Road. The cavalry’s wagon trains and supplies at Burgess Mill were endangered. Leaving behind Hart’s Battery and a handful of Dunovant’s cavalrymen – 125 men in all – to delay Gregg, Hampton raced for the White Oak Road with Butler’s Division to block Hancock’s thrust to the Southside Railroad. He ordered Maj. Gen. William H.F. Lee to move up a side road and take position in Hancock’s rear. Some time after 10 a.m., impatient at the delay and worried that the Confederates might divert troops to attack Hancock, Meade’s Chief of Staff, Maj. Gen. Andrew Humphreys, ordered Warren to send a division across the Run to try to turn the Confederate right. Warren selected Crawford’s division, whose commander was the slowest and most inept leader in his corps. The division began crossing at 11:45 a.m. Grant and Meade did not order the rest of Warren’s corps to cross, a grave error since it meant that Warren’s men would be idle for the rest of the day and that Hancock’s outnumbered, isolated corps would be exposed to extreme danger west of Hatcher’s Run. 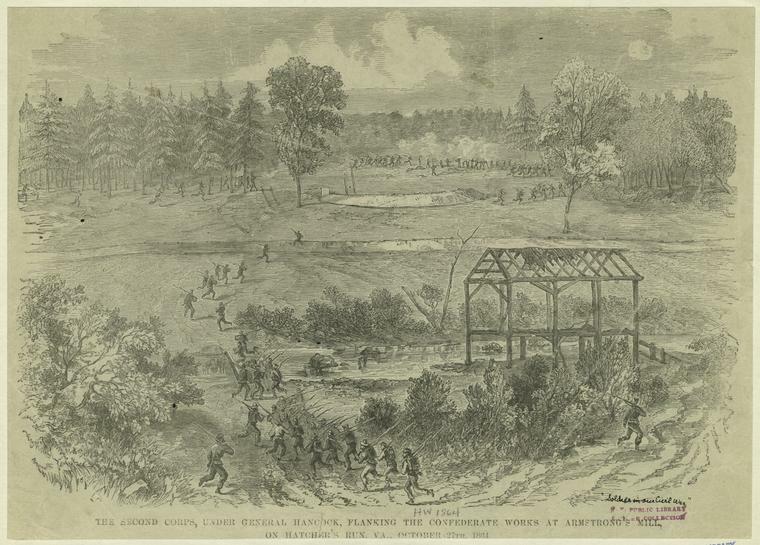 At about noon, Dearing reached the plateau overlooking Burgess Mill at — and found the Boydton Plank Road full of Hancock’s advancing soldiers. Cut off from Hampton, he deployed his troopers, opened fire on Hancock with his cannon and sent a messenger to notify Heth, the first Heth had learned that Federals were west of Hatcher’s Run (Hampton had sent him several messages notifying him of this, but the messengers had been captured). 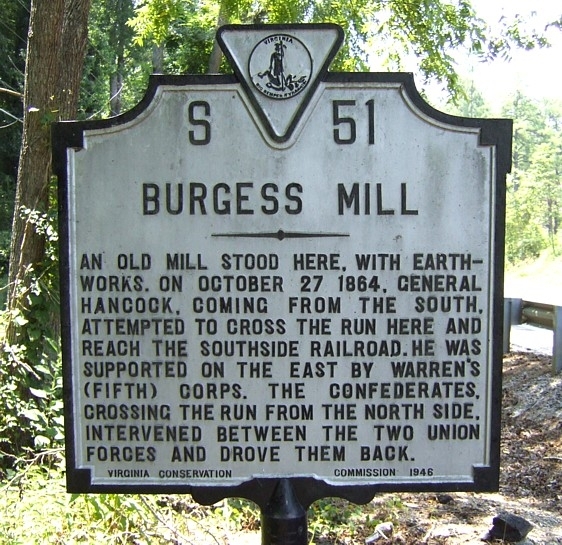 Col. Taliaferro’s 7th Confederate Cavalry crossed the bridge at the Mill and took position on a hill near the Burgess House. In the meantime, Col. Ferebee’s 4th North Carolina and Col. Joel Griffin’s 8th Georgia Cavalry halted on a hill on the Petersburg side of the bridge. During the next half hour, Dearing reinforced Taliaferro with the other two regiments, occupying a line of entrenchments at the mill, awaiting a chance to attack the Federals who were rapidly deploying south of the mill. Hampton’s camp was hastily evacuated and his wagons dashed past Dearing’s brigade across Hatcher’s run. Shortly afterwards, Hampton arrived at the White Oak Road and opened fire with his cannon as well. He had again split his force, but with Lee south of Hancock, Butler northwest and Dearing northeast, he was in a good position to strike the Federals from three directions – when reinforcement arrived from Petersburg. Maj. Gen. Heth opened communication with Hampton and the two commanders formed a brilliant plan: Heth would remove several brigades from Hill’s lines and would cross a dam near Burgess Mill and take position on Hancock’s right, opposite Butler’s Division. Shortly afterwards, Lt. Gen. Hill notified Heth that part of the attacking force would consist of Weisiger’s and Sanders’ Brigades of Mahone’s Division and that the attacking column would be placed them under Mahone. (Harris’ Brigade of Mahone’s Division was also slated for the assault, but was delayed due to the difficult of leaving the trenches without alerting the enemy). Hill ordered Heth to supply as much of his division as he could. Heth gave Mahone McRae’s N.C. Brigade, one of his best units, increasing his force to between 4500 and 5000 men. Heth also ordered Harris’ Brigade of Mahone’s Division and Scales’ brigade of Wilcox’s division to join Dearing at the bridge by Burgess Mill. Heth’s and Hampton’s combined forces would completely surround Hancock and would attack him when Mahone’s guns opened. When Dearing’s and Hampton’s batteries opened fire on his advancing column, Hancock halted, unwilling to advance as long as Confederate artillery commanded his line. He ordered Beck’s Battery, 5th U.S. Artillery to the front, and assigned Smyth’s brigade, Egan’s division to protect them. An artillery duel began and continued until 1 p.m. when Taliaferro’s 7th Confederate Cavalry drove back the Union skirmishers from Smyth’s brigade from Beck’s guns. Seeing the guns exposed, Dearing attacked with his entire brigade. Smyth charged forward and repulsed Dearing who retired hastily across the bridge. Dearing’s men took up position in a grove of trees and kept up an annoying fire on Egan’s division. Dearing notified Heth that the road across the bridge now lay open. Heth hurriedly rode to survey the situation. He found Harris had joined Dearing and ordered them to hold their ground at all hazards – and to attack the Federals when Mahone’s guns opened fire. At this point Crawford’s division, began its slow advance against the Confederate right flank. Heth was notified of the fact and hurried to meet this new crisis, but found when he arrived that Davis had sent part of his brigade across the creek and had checked Crawford. At about 1 p.m. shortly after Dearing’s repulse, Grant and Meade joined Hancock on the battlefield. 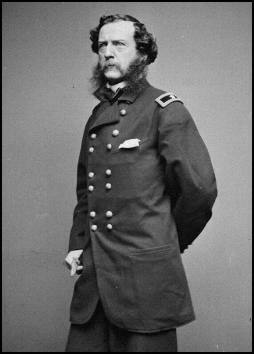 Grant examined the terrain, decided that the movement was too risky and ordered Hancock to halt. He would remain on the ground until the next morning and then return to his lines. Shortly afterwards, Gregg’s cavalry division joined Hancock, having driven Hart from Gravelly Run. Between 3 and 4 p.m. Dearing’s cannon fire became so annoying that Hancock sent Egan’s division, with McAllister’s brigade of Mott’s Division in support, to drive the Confederates back. Just after 4 p.m. Egan attacked, drove back Dearing and Harris, took a cannon and occupied some high ground beyond the trees. By 4 p.m., over four hours after he had crossed Hatcher’s Run, Crawford had advanced only 1 ½ miles towards Hancock’s right flank. A gap nearly a mile wide separated his left and Hancock’s right. At about 4 p.m. Hancock occupied a dangerous position. His two divisions were separated – Egan’s division and McAllister’s brigade of Mott’s division were north of Hatcher’s Run; Mott’s other two brigades faced north, supporting Egan, Pierce’s brigade east of the Boydton Plank Road, along with Metchalf’s section of Beck’s Battery, and de Torbriand’s brigade on the west. Kerwin’s cavalry brigade was placed on de Trobriand’s left and Gregg’s other two brigades were behind Kerwin. Shortly before 5 p.m. Pierce heard firing on his right flank. Assuming that Crawford’s skirmishers were approaching and encountering Confederate resistance, he did nothing. Suddenly Mahone hit Pierce’s right flank with three brigades. The Federals tried to change front to resist the attack, but didn’t have time. Metcalf fired a few rounds, but was overrun, as was Pierce. Several hundred men and two guns were captured. Mahone had been facing west. He now shifted his position and faced south with McRae on his right Weisiger on his left, and Sanders nearby – and attacked de Trobriand and Kerwin. The Federals held firm, however. McAllister’s Brigade, on the north side of the creek with Egan, heard the firing, turned about and marched south. He struck McRae’s flank. Simultaneously, Kerwin and de Trobriand attacked Weisiger. After bloody fighting, the Confederates were driven from the field into the woods. Dearing, Harris, and Scales attacked Egan, but their assault was so feeble that it made no impression. In fact, Egan dispatched a portion of his command to join Mott’s hard-pressed division. Almost simultaneously, Hampton’s cavalry corps attacked. Under Hampton’s personal command, Butler’s division charged across and open field and struck Hancock’s left. De Trobriand turned about and slowed the assault until elements of Egan’s division joined him. The Confederates charged directly into the muzzles of the Union infantry’s rifles and fell by the score (among them two of Hampton’s own sons) – but they could not break the Union line. Maj. Gen. Lee’s division, consisting of Beale’s Virginia and Barringer’s N.C. brigades attacked the 21st Pennsylvania on the Boydton Plank Road. The lone Union regiment stood its ground long enough for Gregg to rush south with his division. Although forced back some distance, the Federals withstood the attack and inflicted severe losses on Lee. Hancock’s corps was badly mauled, losing 1055 men, 15% of his 7000 men. Gregg’s cavalry lost 270 casualties. The Confederates lost heavily as well, over 900 infantrymen and 300 cavalrymen. The infantry were badly scattered. Portions of Weisiger’s brigade got lost and strayed into Crawford’s lines. Despite the setback, the irrepressible Mahone urged Heth to attack again immediately. Heth refused, knowing that Hill would reinforce him the next day. Although Meade offered to reinforce him that night with Ayre’s Division, V Corps, Hancock decided to retreat immediately. At 10 p.m. he began to retire and by next day he had returned to his lines. Both sides suffered heavy casualties. Union casualties in the II, V, IX Corps and in the cavalry totaled 1777 (168 killed, 1024 wounded, 585 missing) of about 32,000 soldiers. The II Corps lost 1055 of these casualties, the V, 279, the IX, 150, and the cavalry, 270. The Confederates lost over 1300. Davis and Cooke lost 50 in their skirmishing with the V and IX Corps. The rest of the casualties occurred west of Hatcher’s Run in the fight against Hancock. The Battle of Burgess Mill is remarkable for a number of reasons. It is one of the most exciting battles of the Siege of Petersburg. On several occasions, one side seemed about to win a victory – and then suddenly the other side gained the upper hand. This happened when Hampton trapped Gregg’s Division at Gravelly Run and when Mahone and Hampton attacked Hancock from all sides. The battle is also intriguing because the dismounted cavalry on both sides fought with exceptional bravery and steadiness. The only other such battle is Dinwiddie Court House on March 31, 1865. Finally, the battle is noteworthy because it is one of the few battles in which William Mahone failed to defeat the Federals. After an almost unbroken series of successes during the summer and fall of 1864, Mahone failed to defeat a Union force. This failure was due to the insufficient force given him for his flanking movement. The October 27th movement to the South Railroad failed for two reasons: Grant did not give Hancock enough troops to carry out his mission and he did not press the Confederates firmly enough with the V and IX Corps. Parke’s and Warren’s attacks were so feeble that Hill was able to send six of his fourteen brigades to attack Hancock. The 6th, 12th’s and 41st’s figures come from the rosters in the back of the regimental histories published by H.E. Howard. The 61st’s come from a statement in the regiment’s record of events. The brigade probably lost 40 or 50 casualties. Participated in the fight against Egan at the bridge over Hatcher’s Run, along with Scales and Dearing. The brigade probably lost only a score of casualties. (MC R479 Papers of Gen. Harry Heth “Report Casualties on the 27th). Scales was engaged by the Mill Pond, along with Dearing and Harris. He probably lost 12 or 15 men. The brigade probably lost 50 or 60 casualties. W.H.F. Lee’s Division probably lost 130 casualties. The brigade probably lost 20 or 25 casualties. Butler’s Division probably lost about 90 casualties. My Great-Great Uncles, Benjamin Franklin Absher, Owen Absher & Alfred Absher were Privates of the 52nd, Company F, Wilkes, NC. Owen & Alfred died in Goldsboro, Wayne County, NC, during the Battle of Goldsboro Bridge. Benjamin Absher, their brother, was in the Battle of Burgess Mill. The 52nd was part of Gen. McRae’s NC Brigade, sent to Gen. Mahone during the battle by Gen. Heath. He was captured on 27 October 1864. He was a POW at Point Lookout, MD and exchanged 17 March 1865.